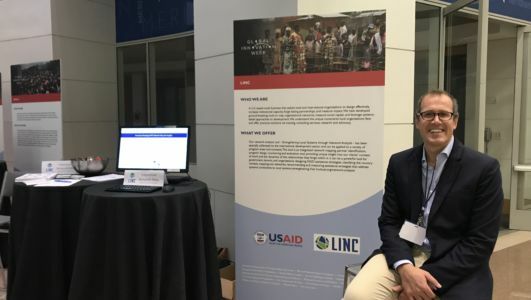 LINC was honored to be a featured presenter at this year’s 2017 Global Innovation Week (GIW 2017), an event that brings together leading innovators, industry experts, researchers and scientists to showcase the latest thinking around innovation in international development. 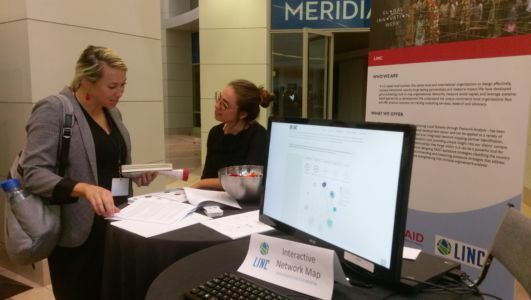 At the September 28 event LINC launched a new, interactive network map, demonstrating the power of our network analysis tool to inform the design of workforce development interventions in Nicaragua. LINC Managing Director, Patrick Sommerville, also served on an expert panel to discuss new innovations in evidence-based monitoring and evaluation. The panel featured LINC’s work in this area and examined prospects for scale-up. NGOs are plentiful and entrepreneurial partners in the workforce development space, but constrained by a lack of power and influence, making them less suitable for leadership of advocacy initiatives. 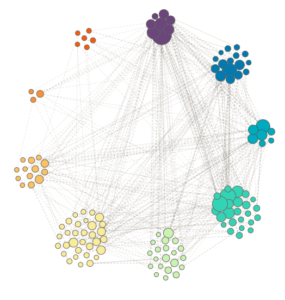 Among all organization types, donors are the most highly engaged and central to the network, introducing questions as to the extent to which they should directly intervene in the system rather than playing a more facilitative role. Major gaps exist linking graduates of training institutes to employers and employment agencies, serving as impetus for workforce development programming to link these actors. As part of GIW 2017, LINC’s Managing Director, Patrick Sommerville, served on an expert panel, entitled: “Improving Ongoing Decision-making: Innovations in Monitoring, Evaluation, Research and Learning (MEL)”. The panel included Michael Woolcock, a leading expert in this space currently at the World Bank, Sarah Beiber, Director at USAID’s Global Development Lab, and Neil Buddy Shah, CEO of IDinsight. The discussion examined the extent to which new innovations in MEL are “the real thing”, or just hype. Several examples of practical solutions such as LINC’s systems mapping and IDinsights developmental evaluation approaches were highlighted and discussed. There was much discussion on constraints to scale-up extending beyond the tools themselves, including human capacity, project and institutional frameworks, and data utilization. The panel agreed that while there are several promising signs in this arena, there is much work to be done in moving forward; a challenge for us all. For more information on GIW, visit http://giw2017.org/.